In 1931 Republican President Herbert Hoover and drug czar Harry Anslinger were pressuring Germany into additional curbs on heroin exportation while semisocialist Germany’s victims were demanding reparations payments under the Treaty of Versailles (which the US did not ratify, but which still involved $10 trillion in gold). Hoover’s error is relevant to ongoing efforts to extricate These States from the Vichy Paris carbon tax extortion the Obama Administration tried to smuggle past the Senate. Already there is a severe shortage of nuclear power plants in These States–which is the whole reason engineers are forced to rely on coal–which is less clean and less safe by comparison. The Paris Capitulation can only benefit Communist China at the expense of the relatively free world. As 1931 stupefacient drug prohibition negotiations proceeded, banks in Germany and Austria failed. Depositors were removing their money because they knew the influx of dope money would stop, but reparations claims were persistent. Hoover’s brilliant idea was to let France, Britain, Italy, Russia and others “temporarily” default on war loans payable to the USA. In exchange, they would let Christian altruist Germany default on reparations payments owed to the USA. That was the lose-lose theory of coercive prohibitionism. What happened under the Moratorium was that Germany kept exporting addictive poisons and using the money to build up the Steel Helmets, build submarines and battleships and entrench the National Socialist party. Immediately all of Europe began defaulting on war debts, and even commercial loans of private US capital. Ayn Rand was a Hollywood writer and reader hanging out with pre-code movie stars like Barbara Stanwyck, watching Three on a Match (with husband Frank O’Connor), Scarface, Night Nurse (bootlegger hero), Dinner at Eight, The Secret Six and old Alma Rubens movies. At age 24, newlywed immigrant Ayn Rand was certainly aware of Russian and German anti-jewish fanaticism. 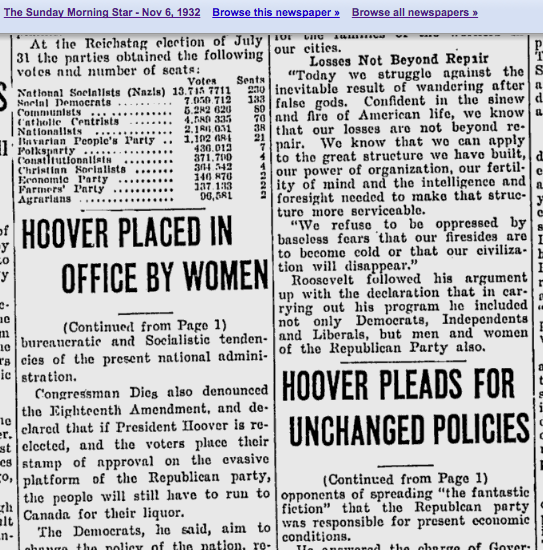 All of America was painfully aware of Hoover’s solicitous concern for The Accursed Hun. The smart Moratorium in Atlas Shrugged is Hank Rearden voluntarily offering rail on credit to Taggart Transcontinental. 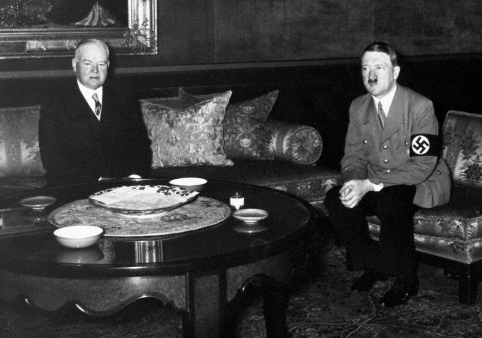 The dumb Moratorium in 1931 was Hoover helping Hitler’s backers arm and control Germany’s government. To this Ayn Rand drew too vague an analogy with the Moratorium on Brains in Atlas. Nor did she clarify the connection, possibly for fear of weakening Barry Goldwater’s GOP while the Soviet still existed. Dwight Eisenhower was, after all, the conquering Republican president of both These States and the Government of Occupation, and Richard Nixon was his vice-president and anticommunist Wingman when Atlas Shrugged was finally published. But the book was already in its tenth chapter in 1947, when Christian National Socialists were denying ever having so much as suspected that Henry Ford’s Fuehrer’s promise to “extirpate” jewish egoism in Mein Kampf was anything but a joke. That was the year Rand composed the Non-Aggression Pledge. That tersely-worded individual decision established a modern ethical position consistent with the era of mature nuclear physics.